IBM is no stranger to transformation. Over its more than 100-year history, the company has reinvented itself repeatedly, creating one of the most trusted brands in the world and continually earning its stripes as a leading innovator. Right now, IBM is in the midst of one of its largest reinvention efforts to date, and we’re honored that Oblong technology is helping IBM illustrate how it is driving such rapid and meaningful change. IBM’s massive, design-centered pivot, as highlighted in the New York Times last year, is pioneering a paradigm shift in the way organizations solve problems and make decisions. That same dedication to design in the service of enterprise-scale work closely mirrors our focus at Oblong. So it makes sense that IBM is engaging us to help create immersive experiences that deliver on their reinvented vision—particularly with its Watson initiatives. 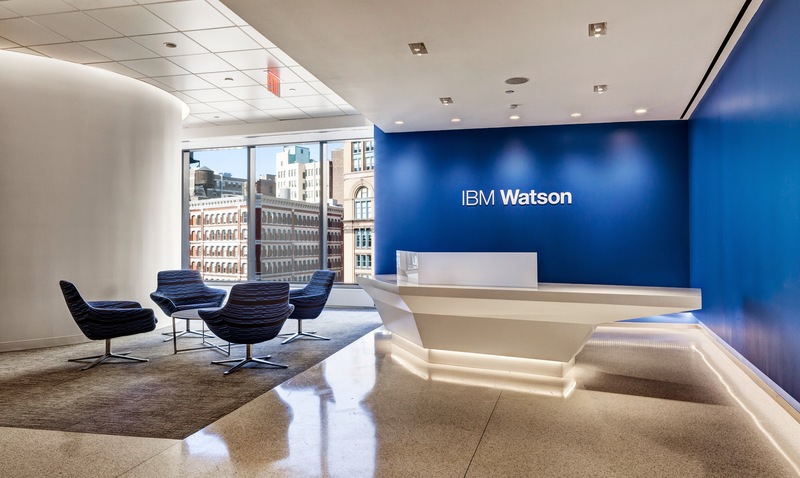 As Watson is a key part of IBM’s transformation, the company needed to bring this groundbreaking cognitive computing technology to life for its customers. IBM sought a way for clients to interact with various Watson solutions and visualize use cases for the technology. 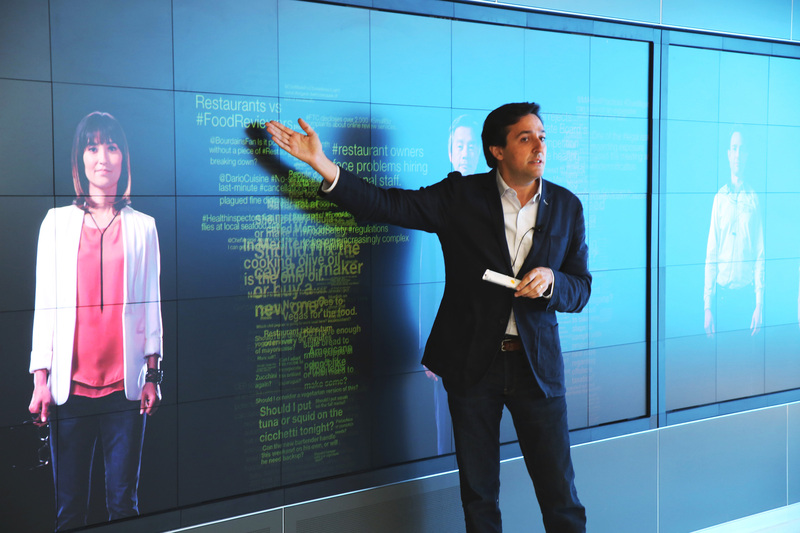 The Oblong Solutions team built a suite of custom applications atop our exclusive g-speak spatial operating environment to enable several dynamic, larger-than-life displays at the first Watson Experience Center (WEC) in IBM’s Watson headquarters at Astor Place in New York City. We integrated these unique interactive systems with our proven Mezzanine offering to provide a continuous experience (with high wow factor) and, more importantly, to facilitate collaboration between IBM’s solutions architects and its clients. With the flick of a wand, users can grab content from any one of the expansive displays and drop it into a nearby exploratory room—or “THINKTank”—equipped with Mezzanine. Mezzanine in the THINKTanks enriches the Watson teams’ sessions with Infopresence—the experience of group immersion in vital content to achieve heightened real-time collaboration, within a room and across locations. This means that anyone at the WEC can interact and work seamlessly with researchers at other IBM locations, and all participants can draw from multiple systems and applications to help them solve challenges in a transformatively fluid and parallel way. With Infopresence and our cutting-edge g-speak applications providing a vivid, interactive connection between cognitive computing and spatial computing, the Astor Place WEC achieved instant success—the facility is consistently booked months in advance. It was clear that the Center needed to expand. The global Watson centers are scaled down to conference room size to meet the needs of global markets, but still offer the full-throttle experience of the original CEC through the same custom interface and Mezzanine technology. These spaces have extended IBM’s cognitive vision around the globe, with locations in Australia, Singapore, Brazil, England, and Ireland. The global centers aren’t the only expansion. 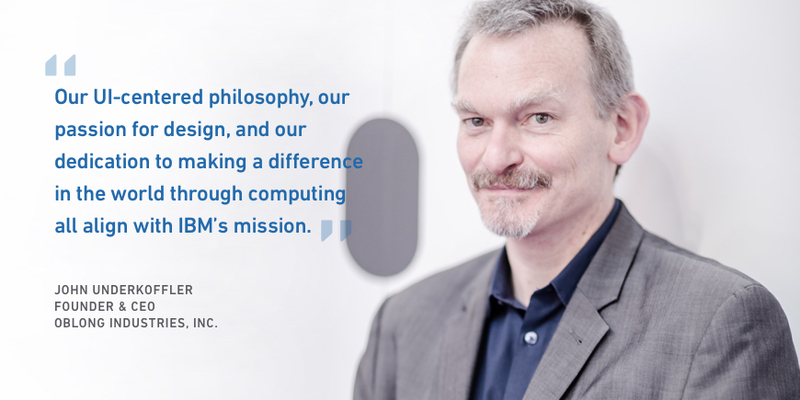 We’ve also helped IBM create three new large-scale WECs focused on core industries: Watson Health in Cambridge, Massachusetts; IBM Commerce and Watson in San Francisco, California; and Watson IoT in Munich, Germany. Oblong’s technology is a key enabler at these locations, and you can see our expanding work with IBM in action across other initiatives, like the IBM THINKLab, Security, and Dev Labs.